A record number of Americans read, saw or heard something about Hillary Clinton and Donald Trump in the days after the first presidential debate Monday night, higher than was the case during the two candidates' conventions. On Tuesday, 91% of those Gallup interviewed said they read, saw or heard something about Clinton "within the last day or two," which tied the percentage on Sept.14, when Clinton's health was in the news following her near-collapse at a Sept. 11 ceremony and her subsequent announcement that she had pneumonia. Ninety percent read or heard something about Trump on Tuesday, one percentage point higher than his previous high recorded immediately following the Republican National Convention. By Wednesday and Thursday night, this measure of the impact of the candidates on the public's consciousness began to drop, but remained high. Overall, 73% and 72% of Americans reported hearing about Clinton and Trump, respectively, in the three days leading up to the debate (Sept. 23-25), while 86% and 88% recalled hearing about them in the three days after (Sept. 27-29). Due mostly to the attention from the debate, the two candidates are at a rare moment of parity in terms of how many Americans recall reading or hearing something about them. Since July, Trump has generally been more dominant in Americans' consciousness, with Clinton besting him on this measure only occasionally, such as during the Democratic National Convention and in the days following her near-collapse. So far, the debate has had a minimal impact on the images of the two candidates. 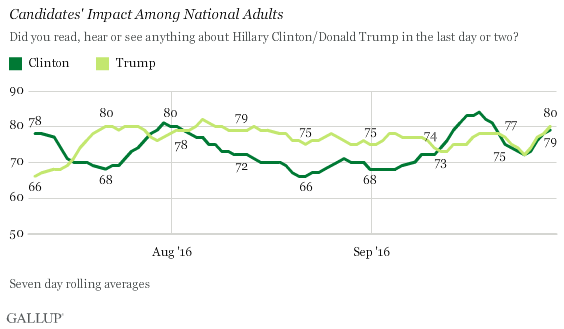 Though Gallup found that the majority of U.S. adults believe Clinton won the debate, Trump thus far has been the candidate to see a very slight rise in his favorable rating. For the seven-day period spanning Sept.19-25, Trump had an average favorable rating of 32%. For the three-day period from Sept. 27-29, Trump's favorable rating stood at 35%. Clinton, by contrast, saw no change. From Sept.19-25, Clinton's favorable rating averaged 41% -- the same rate for Tuesday, Wednesday and Thursday of this week. Thus, if the debate is to have a meaningful impact on either of the candidates' images, it has yet to surface. This is in contrast to the image boost Clinton received from the July 25-28 Democratic National Convention, which became apparent while the convention was still in progress and before Clinton gave her prime-time speech accepting the party nomination. Before the convention, Clinton had a seven-day favorable rating average of 37%. By the third day of the convention, her daily favorable rating hit 43%. Three days after Clinton's speech, her three-day favorable rating average was 44%. Trump's seven-day rating before his GOP convention was 33%, and over three days following his speech (Friday through Sunday; Gallup did not interview on the Thursday following his speech), his favorable rating edged up to 37%. Historical evidence suggests it is not unusual for presidential candidates to be widely seen as the victor of a debate but receive no boost in their public image or support. In 2012, for instance, Mitt Romney was seen as the winner of the first presidential debate, but Gallup found this had little impact on his overall support. And, as Gallup's Lydia Saad noted recently, history shows a number of presidential debate winners would later lose the election -- including John Kerry, Ross Perot and Walter Mondale. When asked what they had read, seen or heard about the presidential candidates over the past three days (Sept. 27-29), most Americans mentioned the candidates' participation in the debates. Positive comments about Clinton's performance included such sentiment that Clinton "won," that she was "prepared," appeared "presidential" and appeared "smart." The relatively fewer Americans who said something negative about her debate performance said she "lied" during the debate or did not address the email issue in a satisfying way or respondents disagreed with positions Clinton mentioned during the debate, such as tax or trade policy. Americans who offered the opinion that Trump had done poorly in the debate said that he sounded "rude," that he interrupted Clinton too many times or that he said something false. But Americans also zeroed in on particular things Trump said during the debate, including his comment that not paying income taxes makes him "smart." Toward the end of the debate, Clinton accused Trump of deriding a former Miss Universe contestant for gaining weight. This comment and Trump's subsequent comments to the media about the incident also became topics for some respondents, who used words such as "woman," "Miss Universe," "pig/piggy" or "fat." All in all, the data make it clear that Americans were paying attention to the debate on Monday night, but it is less clear if there has been or will be any long-term impact from the occasion. There does seem to be movement in the "read, seen or heard" comments, revealed in parallel analyses at the University of Michigan. Whether these lead to changes in favorables remains to be seen. The two vice presidential candidates' debate on Tuesday night at Longwood University in Virginia, and Clinton and Trump go at it again in a town hall format debate in St. Louis on Oct. 9. By 61% to 27%, Americans who tuned in to Monday night's presidential debate believe Hillary Clinton, rather than Donald Trump, did the better job. This victory is among the larger leads in Gallup polls since 1960.